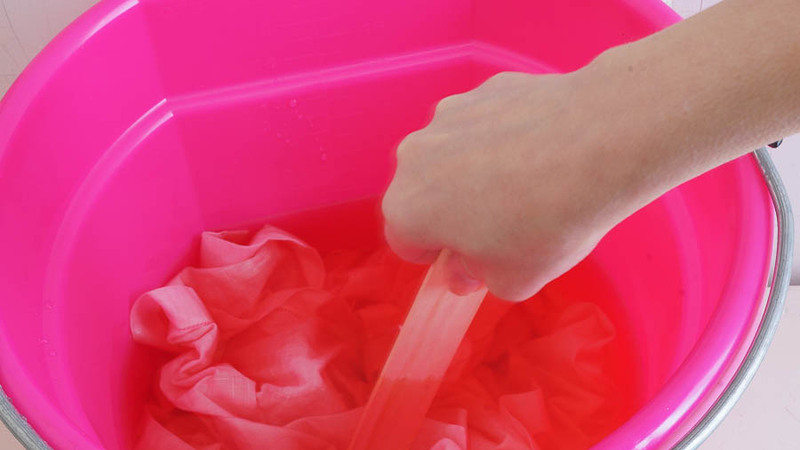 How To Dye Cotton Napkins The Easy Way! I have a love for soft pastel colors. Especially this time of the year. I think spring time screams pastel colors. I love using my fabric napkins for every day. I think it’s a great way to recycle and not use paper napkins. It also makes each meal special whether we are entertaining or not. If you’ve been looking for the perfect color napkins but you can’t find them why not dye your own napkins. 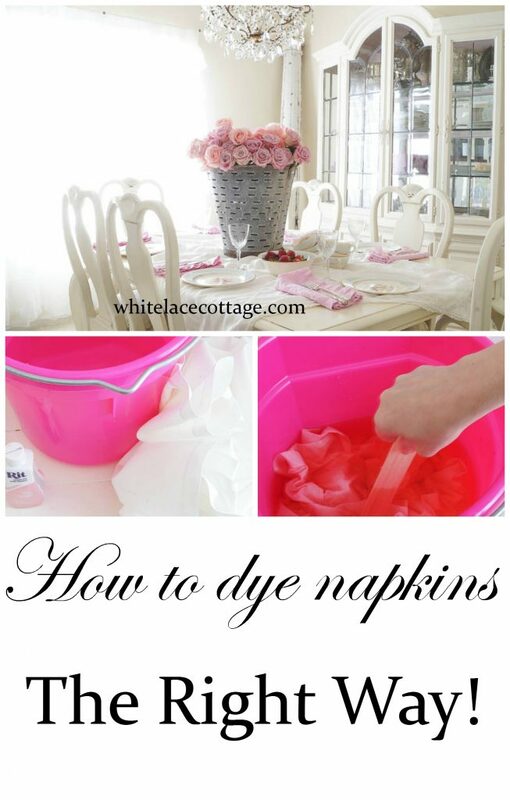 It’s a very easy process and I’m going so show you just how easy to dye cotton napkins. First let’s talk about dyeing fabric and what you’ll need to use for this project. Also the fabrics to avoid. The fabric that I used to my napkins is cotton. This is the best choice for dyeing fabric. Poly-cotton or poly fabrics won’t work well at all. The dye will not absorb into the fabric. I’m using a extra large bucket to show how to dye cotton napkins because the lighting is much better in my dining room than it is in my laundry sink. Plus let’s be honest. I really don’t want to share how gross my laundry sink looks. 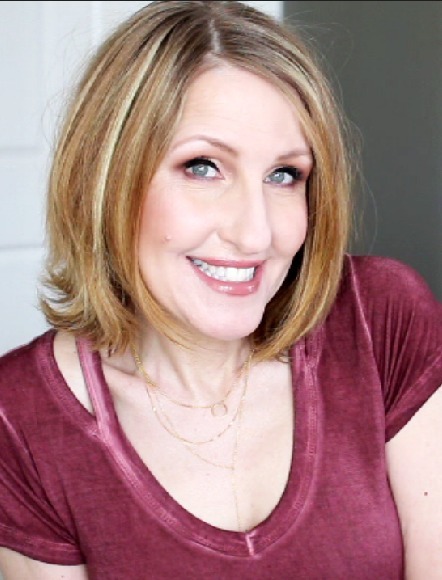 **Disclaimer… please read directions on your package, I am sharing what I did** I am an artist and I like experimenting, I decided to use Petal Pink and Purple, from Rit. You can purchase this dye at a craft store and I think Walmart carries this too! I filled up my bucket with hot water about half way. Then I added what was left in my bottle of dye, which was two tablespoons. After adding this to the water I decided to add a little purple,(not shown in this photo). I added VERY little of the purple because I knew from my past experience that the dark purple would really dominate this color. After I added the dyes to my bucket I took a paint stick and stirred the mixture. Then I added my napkins. Once the napkins were added to the dye I started stirring this again with my paint stick. I also used my paint stick to lift up the napkins to check the color. (you notice I am not wearing gloves, but I recommend that you do) I have to admit using a pink bucket was not a great idea because it was throwing me off a little with the color. Once I was happy with the color I rinsed these out in my laundry tub in our laundry room, then washed and dried these. Here they are. I love this soft pastel color, and I also love how wrinkled these napkins are. 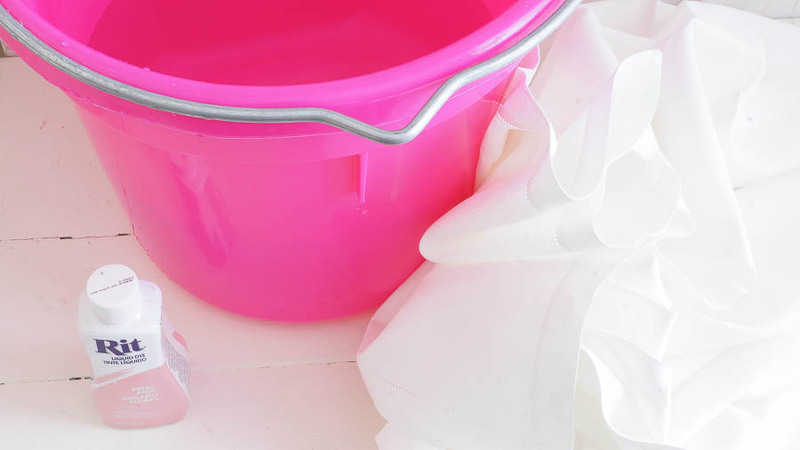 I’d like to leave you with a few tips that I’ve learned from dyeing fabrics. I am no expert just sharing what’s worked for me. 1). Use a little dye at a time, if you add too much it’s hard to remove. 2). Use a natural fiber such as cotton, the dye adheres much better to a natural fiber. 3). I use warm or hot water, just use caution. 4). Add a little salt to the water. Salt will make the dye adhere to the fabric easier. 5). Use a wood stick like a painting stick. It makes it easier to stir. 7). Wear plastic gloves this dye will stain your hands. I leave you with this simple tablescape that I created a few years ago when my dining room was full of shabby chic beauty. 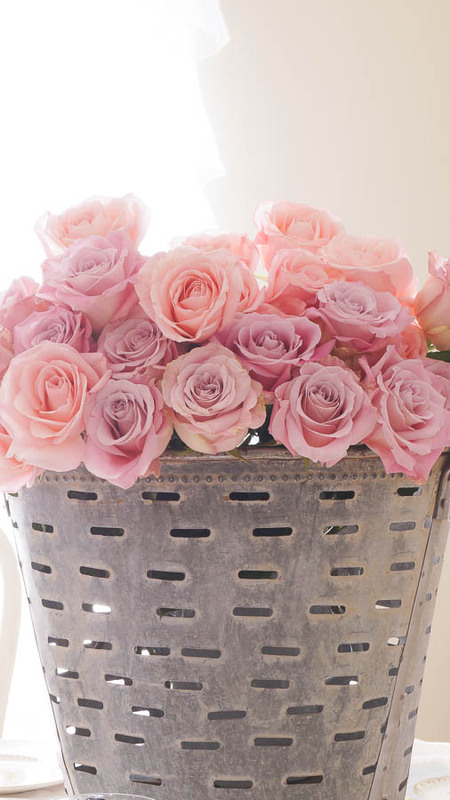 I love the olive pitcher of roses. But this is for photo purposes only. If I had guests this would be a bit large. It is pretty to look at don’t you think? Are you getting your home ready for spring? How do you decorate? 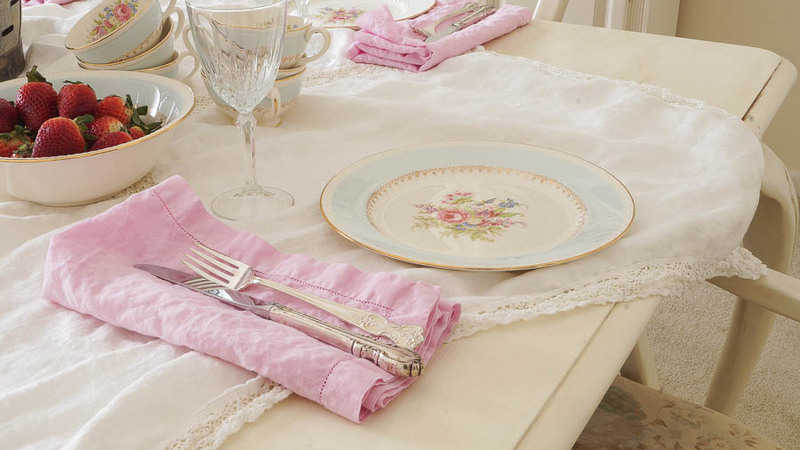 Beautiful pink in those napkins. I’m the die hard dye girl of at least 40 years. I’ve dyed everything, clothes, tablecloths, shoes, you name it. The way I do it, is, if it’s cotton & will fit in a big boiler on the stove, I boil it for 45 mins. Trust me it doesn’t fade later. The other thing I do is if it’s large , eg a tablecloth, put it in the washing machine & agitate it, it spreads the dye really well & then just continue on with the rinsing, very easy. The other thing I always do,is put it into the dye wet, it stops it getting blotches of darker dye in spots. Thank you so much for sharing your tips Philippa! I want to make some batik type fabric panels for decor purposes. Any tips on this anyone? My favorite dye is buying light colored rag rugs at garage sales or thrift stores and then dying the deep primitive color I need. I do this in the washing machine. My rugs always look great and friends ask where I got the color and I tell them, try dye! Thanks for your great posts. That’s a great idea Sharon!Thanks so much for sharing! If you e-mail Decor Steals and ask about your curtains, they will return e-mail you and you can order if they have them in stock. I have done this when I needed material. It is great not to have to put off your projects. Napkins are wonderful and i love your new curtains,are you sure that was an accident or a reason to buy those beautiful curtains. lol Your house is just lovely Anne. I love the curtains. They are so pretty. Your napkins are adorable. The pink is pretty and looks like spring. Thank you Katie, yes we are getting closer to spring around here! 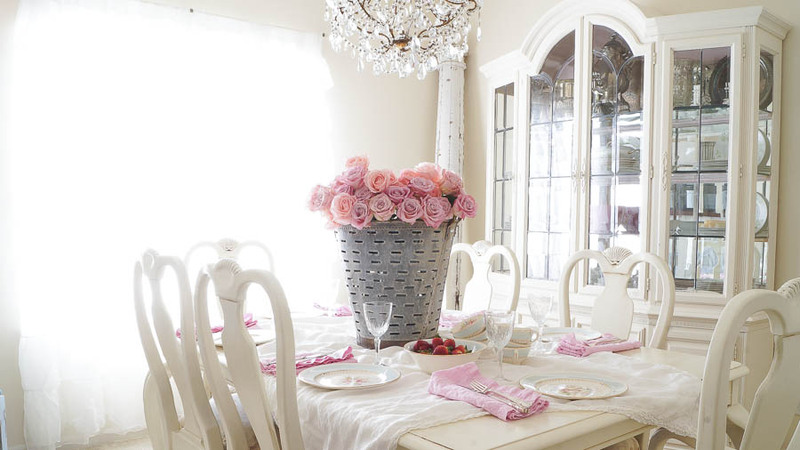 I love the pink in your linen napkins! You’ve inspired me to put some color in mine! Awesome deals you found too.. love that bucket! I have those curtains in my living room, bedroom and in my bathroom as a shower curtain. I love them! Think if we had dining table/chairs we would use fabric napkins, just feels so nice, give entire meal different atmosphere. 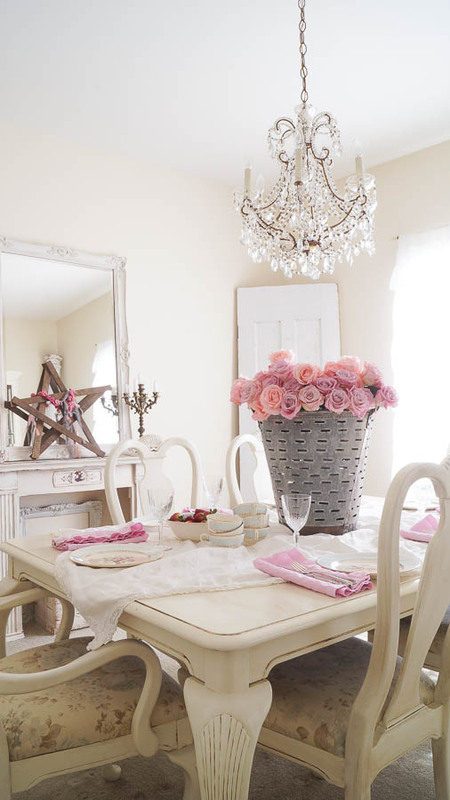 Your table looks very festive for everyday, , I sure miss having dining set and place to put it. Your whole room is so light and soft looking. 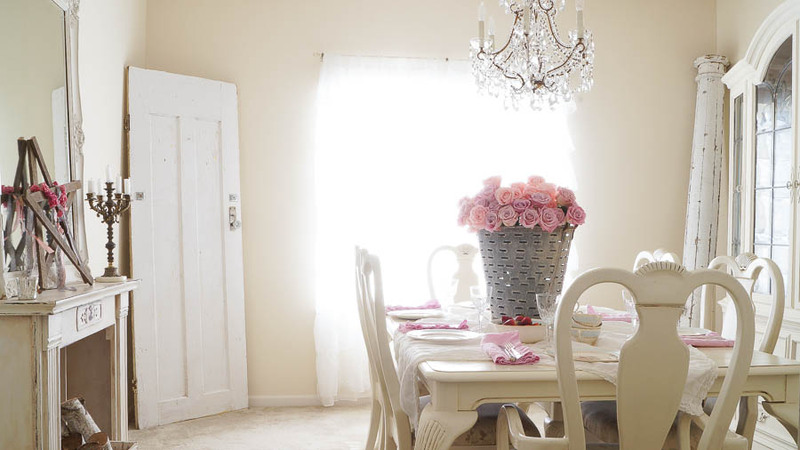 ALSO, ANNIE – What color did you paint your dining room table and chairs?? Looks amazing!!! This is one of the best bucket updates I have read and seen all year. Well done!